Oklahoma Gov. 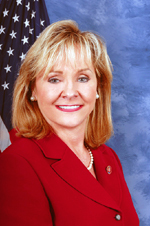 Mary Fallin will deliver the keynote address at the 2014 OCCC Commencement Ceremony at 7:30 p.m. May 16, in the Cox Business Services Convention Center in Oklahoma City. President Paul Sechrist said Fallin was invited to speak at OCCC’s commencement ceremonies last fall. He said OCCC has a long history of inviting state governors to give the keynote address. “Governor Fallin is the fifth governor to address OCCC’s graduating class,” Sechrist said. Since OCCC has been part of the state system of higher education, Sechrist said, the state’s chief executive officer — the governor — is always on the short list of those considered to address graduates. “It’s always an honor to have the governor attend and speak to our graduates,” he said. Students are mixed about having Fallin as the keynote speaker. Pre-pharmacy graduate Amr Elghon-dakly said he is unsure why Fallin was asked to speak. “I think it’s interesting that she has been asked to speak at an educational facility for people graduating when she’s been cutting budgets … and not supporting education,” Elghondakly said. Political science graduate Michael Blunck said while Fallin’s presence might be controversial, it shouldn’t be taken too seriously. Sechrist said, regardless of personal feelings, he hopes OCCC students will remain respectful. An interview request from the Pioneer was turned down by Fallin. For more information about the 2014 OCCC Commencement, visit www.occc.edu/records/Commencement2014. Students who want to tweet the Pioneer about their graduation experience can use #OCCCgrad and #OCCCPioneer or post to the Pioneer Facebook page at www.facebook.com/OCCCPioneer.